BASEKAMP is an artist-group researching and co-developing interdisciplinary, self-organized art projects with other individuals and groups in various authorship-blurring configurations. BASEKAMP is not concerned with who initiates a project or idea, but rather how they can plug-in to each others’ efforts. 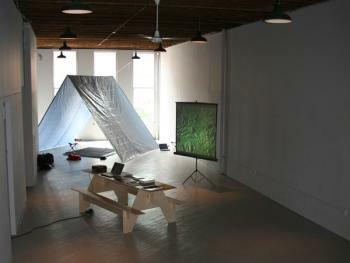 From 1998-2011 the BASEKAMP group ran a collaborative art research center, residency program, and exhibition program by the same name in Philadelphia. The group has since gone mobile, making temporary camps in various locations to invite anyone interested in a joint experiment to develop new models of relations within overlapping art communities. The goal is Organization Without Hierarchy, Attribution Without Ownership, and Value Without Capital. Resulting collaborations appear in non-art contexts, online, in artist-run spaces, institutional venues–or any channel to help further our collective efforts. Let us know if you’d like to join us.